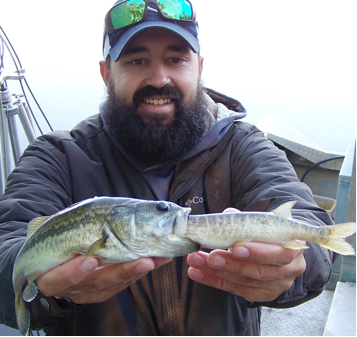 Largemouth bass are top-of-the-line predators. When hungry, they literally consume anything that fits in their mouth. When seemingly full from a recent meal, reflexes still prompt urges to strike a tempting target. How many times have you caught one with remnants of the last meal protruding from its throat and wondered why it struck again? 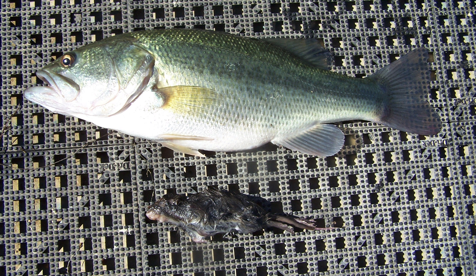 A tail protruding from this bass’ mouth turned-out to be a muskrat. To some folks surprise, bass don’t forage on just other fish or crawfish. They eat snakes, birds, frogs, mice, or any critters that traverse their domain. During an electrofishing survey in Louisiana, Bob reached into the live well to retrieve a large bass and found it had regurgitated a 21-inch cottonmouth water moccasin. 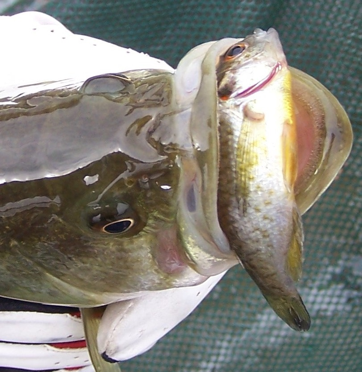 Bass can consume another bass almost 50-percent of their body length. The bigger a bass grows, the bigger meal it prefers. As stated numerous times, a bass must eat 10-pounds of something to gain just one-pound. Primary growing season is warm water months from March through November, so they must capitalize on every opportunity. From December through February, cold water temperatures slow their metabolism and appetite. Caught in the live well. On your next excursion, try something different to draw a memorable strike. Toss a frog near appealing habitat, let it sit until ripples disperse, then gently twitch it. Start and stop swimming action. Some of the most aggressive topwater strikes I recall were using a Scum Frog. Retrieve a weightless 8 to 10-inch worm across the surface to replicate a snake. Remember the big bass, big meal comment. Just before sundown, a friend tied-on a Hula Popper topwater. 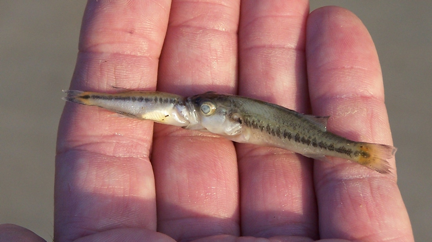 Instead of using popping moves, he drug the bait across the surface making a loud gurgling noise. When I suggested he was scaring fish, he said, just watch. My uncle taught me this technique. Big bass will investigate something in their territory or think it’s their kind of big meal. No sooner than he replied, a 4.5-pounder blew-up on the bait. Very exciting! By dusk, he caught five more from 3 to 6-pounds. Hope you enjoy these highlights from our fascinating work. Please send your favorite photos. We’d love to share them with the Bob Lusk Outdoors / Pond Boss family. Even as fingerlings, instincts are strong. Eyes bigger than its stomach. 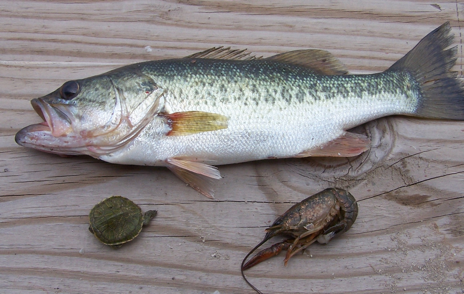 Evaluation of a bulging stomach revealed this turtle and crawfish. This entry was posted on Saturday, June 9th, 2018 at 3:10 pm	and is filed under Articles, News & Updates. You can follow any responses to this entry through the RSS 2.0 feed. Responses are currently closed, but you can trackback from your own site.